« The Truth About Immigration From The BBC? More British workers will ‘lose out’ from the influx of cheap labour from Romania and Bulgaria, Ed Miliband has admitted. The Labour leader insisted it was not ‘prejudiced’ to believe that growing numbers of low-skilled migrants from the European Union would add to the problem of low pay and poor job security. All a bit late from Labour 10 years after they betrayed the British working classes. Labour’s relaxation of controls was a deliberate plan to “open up the UK to mass migration” but that ministers were nervous and reluctant to discuss such a move publicly for fear it would alienate its “core working class vote….it wasn’t necessarily a debate they wanted to have in working men’s clubs in Sheffield or Sunderland.”. The BBC is, as ever, still on the wrong side of the immigration debate….all the more so as it is an organisation legally obliged not to be on any side…and yet it actively campaigns for immigration disregarding, in fact setting out to belittle and discredit the beliefs of the majority on the subject. Immigrants to the UK since 2000 have made a “substantial” contribution to public finances, a report says by Prof Christian Dustmann and Dr Tommaso Frattini from UCL’s Centre for Research and Analysis of Migration. Yet, as the Mail reported yesterday significant questions are now being asked about the accuracy of the academics’ report, which other experts say contains ‘schoolboy errors’. In 2003, ahead of Poland and seven other ex-Eastern Bloc countries joining the EU, Professor Dustmann was one of the authors of the notoriously inept Home Office study predicting that only between 5,000 and 13,000 migrants a year would come to the UK. In the end, more than one million arrived – the largest single wave of immigration to this country since 1066. Indeed, the research was so disastrous that, ahead of Romanian and Bulgarian citizens getting full rights to work this week, the current government refused to repeat the exercise. Is it unfair to suggest that, having so spectacularly underestimated the number of Eastern Europeans who would arrive in the UK post-2004, Professor Dustmann might feel inclined to ‘spin’ their positive impact? Prof Dustman runs the Centre for Research and Analysis of Immigration…CReAM for short…. a pressure group for immigration. So Dustman might have a vested interest in promoting mass immigration apart from his own beliefs…but what about his co author Dr Tommaso Frattini? An educated man…he’s got a PhD in economics…but who taught him? And Ian Preston?…Ian Preston, Deputy Research Director of CReAM. Small world eh? Great minds all think alike. OK…academics with an axe to grind on their own special subject….what you might expect….but you might also expect the BBC to take a more nuanced look at their claims. A very small world indeed. In 2013 it organised the Migration: Global Development, New Frontiers…Interdisciplinary conference on migration. Interesting who not only turned up, not to report on it, but to actively participate in the conference…Harrabin Mk II. That’s right…as an active speaker at the conference rather than as a reporter, the BBC’s very own Mark Easton made an appearance. Easton is of course fervently pro-immigration…telling us once that we ‘should just get used to it’…no suggestion that it might be possible or legitimate to control it. 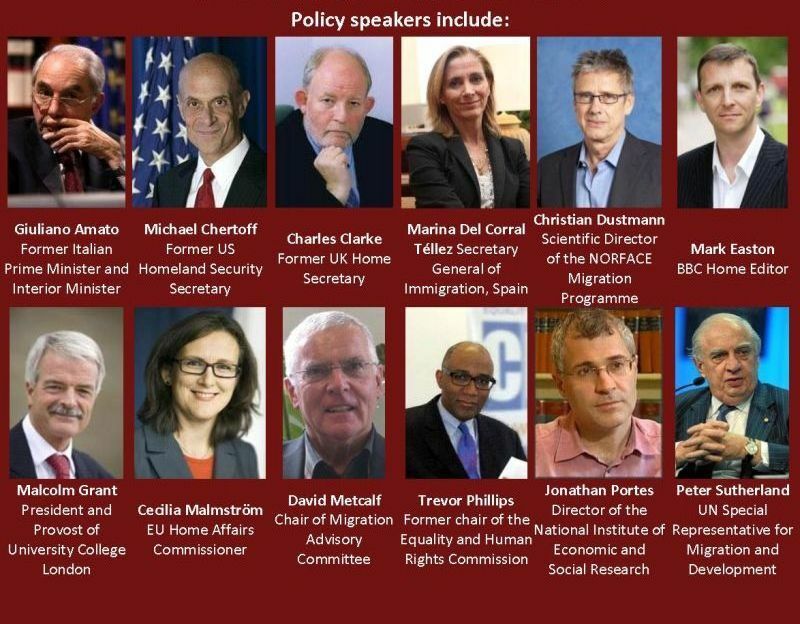 So a pro immigration Professor who worked with the Labour Party to sell us a lie about immigration, whose co-author was taught by him, whose organisation has the very same Labour minister who opened the doors for mass immigration working alongside him, and who has the BBC’s Mark Easton on call to talk about immigration at his conferences. Nothing to see here guv! Peter Sutherland – enemy of freedom & democracy. Another traitor within. Note place of birth. Time for the People to smash the corrupt paedo infested BBC. Britain doesnt have a Department of Inland Security or an Interior Ministry . It has the Home Office . A nice comforting term for the government department that should look after our affairs because basically we thought the nation was an extension of our homes , with people about to look after us as we looked after them . So as with our home , so with our country . We decide who can come here , for how long and what their behaviour and attitude should be . We do not want any crooks , chancers or idlers to come here , not even as a moral equivalence of any foreigner who does us some benefit . We do not want anyone to stay one minute here who has abused our hospitality , never mind comit a crime or draw benefits . As with our homes , if a foreigner does come and is of benefit , he is not entitled to stay forever or draw on our resources . Let’s say a plumber or doctor comes to your house to perform a function , would you expect him to say ” I’ve cured your child , I’m now going to stay here ,” or” that’s your toilet unblocked , now I’m moving in “? Let’s get real . This is our country , and we should be left alone to live in it as we want ( even if our politicians want to stomp about on the world stage ) . The photo looks like a wanted poster for the top 12 traitors ( of course there are many who have done worse to our country than this lot) but who wouldn’t wish they could give them all a sound beating. A good post and useful information. All these poeple are well heeled and well connected. None of them have the slightest interest in the future of my valley and my little part of England. To me they are the enemy as they should be the enemy of all true conservatives in the land. Reality will teach them that they are not little gods to dispose of people and nations as their absurd theories dictate. Never listen to them and never argue with them. Agree, excellent info tying in Clarke, Easton, Metcalfe, Portes, Phillips et al. Labour Party + BBC-NUJ = Mass Immigration. -are all politically campaigning for Turkey’s 80 million Muslims to get entry into E.U. (and into U.K). Couching the debate in terms of net cost or benefit, or whose jobs they are taking, is missing the point in my opinion. The fact remains, people in places like Bradford did not, as far as I can recall, want to emigrate to Pakistan, but they had Pakistan brought to them regardless. And we all know what happened to people like Ray Honeyford who drew attention to the shortcomings of this policy. The debate is more open than it was a decade or two ago, but the parameters are still largely restricted to economic impact and EU immigration. The fact remains, if some people want their country to be transformed into something entirely different, their requirements will be met more promptly, and much more effectively, if they emigrate to whatever country they admire so much. ed miillband has being doing the rounds today in the media apologising for eastern european immigration and saying new labour got it wrong on that score,i dont believe him and i think this is pre election fakery from the labour party pretending they are concerned about the publics disgust at the open door policy that they had when they was in power,but not once in this immigration debate have i heard from millband and co about there free for all open doors policy in 1997 when they let 6 million immigrants from third world countrys in from south east asia and africa into are country and we all know what problems that has caused from crime to terrorism to peadiophile rings that blight many of are big citys and towns up and down the country,never forget as well when jack straw was the home secratary he introduced the primary purpose rule that meant immigrants from countrys like pakistan and india who settled here could bring there whole familys over here to settle with them,that rule was introduced as a ploy by new labour to gets votes of the asian community,that backfired on them and the primary purpose rule has not been reversed by this present goverment,so lets stop this one sided debate only about white eastern european immigration and talk about all immigration from all over the world that has turned england into the most overcrowded ghettoised country in western europe. I do not believe anything that I am hearing from so called ‘official’ outlets. To me, the truth on this matter is yet to be told. The Eastern Europeans Labour could have held back like the French, Germans etc. did. But eventually they had to be let in under EU rules, so there was not much that could have been done in the long run. As for non-EU immigrants, we still can close the boarders to them. There is nothing the EU can or would do to prevent us. So why did they encourage large numbers of people from non-EU countries to come ? And why do they still allow it ? I have no proof, but I believe that the policy was deliberate. Naked gerrymandering coupled with a bit of ethnic cleansing. Neither of these can be proven but I take this view (see above). The BBC’s part in this, and under the rules of its Charter, should have given the full low-down. It should not shy away from issues that are uncomfortable because that only gives tacit approval and encouragement to those whose actions and behavior are at odds with the society and indeed the law. To be fair to the BBC, it isn’t alone. But it has a Charter, it rules and it not only failed in that it failed a Nation and her people. Gerald Celente – I’ve come up with the epiphany that this is not globalization; it’s multinationalization. What we’re looking at is a corporate takeover of such great size and reach that I don’t think anyone has really reflected upon how it impacts so much of society. This is a scandal that will be whitewashed by saying; we got it a bit wrong or some other mealy mouthed excuse. The extent of the bBC involvement in the immigration charade is immense. They will never admit who in the gov told them to start and the extent to which it was to be delivered. The coordination of propaganda ranging from the presentation of selective news items right down to comedy programs all with subliminal messages about, how the public was to think and act relative to all of this subject area. “Migrants ‘Should Wait Five Years For Benefits’. But even Farage has been got at by the anti racist lobby. I am sure that he doesn’t really believe that we should take in Syrian refugees , many of whom will no doubt turn against us the minute they arrive here. He is just forced to say this to avoid being labelled a racist. I wish our politicians would understand that many people, most in my opinion , don’t want any more immigrants, especially ones with alien cultures.We might welcome those who can contribute some skills we are short of but no others. My advice to our politicians is to just stand up and say it and welcome the outrage of the BBC , guardian etc etc. The more they attack you the more support you will have for your views. It isn’t racist to want to preserve your country and its values. By rights, the revelation in this excellent post should spell the end of Mark Easton’s career as a reporter. His membership of this nakedly polemical organisation of pro-immigration fanatics should mean that he is out of the door by the end of today with his possessions in a bin liner. No doubt he would find a home with the Mirror, the Guardian or The Independent. Well… we’ll see what happens, won’t we? And if it doesn’t, we’ll have incontrovertible evidence of the depths to which the BBC has sunk..
How on earth does Evan Dvis get a gig out to Nigeria then? Air miles?..expenses?…is there nothing to report here then? Let me predict that Mexico(Humphrys)…Indonesia(Naughtie) and Thailand(Montague at half term, so no boys wandering around Pattaya after hours eh?) will be the coming gigs for the BBC in 2014. The world is not enough…and the airmiles are nice ones! Oh-not of this post thread, but hope it ends up somewhere else. Slow day at the BBC as the liberal gears crank up for 2014s relentless peashooters at the walls of privilege. So it is that we hear of a “campaign by 50 Savile “oi`s” to stop lumping the BBC in as Saviles vehicle number 1! S`not fair! Bloody Peter Parker gave him a spot on telly in 1972, so is as culpable for Saviles abuse of TOTP kiddies as the BBC is. British Rail need full enquiries and not the BBC…or, at best, need to be lumped into a general ragbag of enquiries costing billions…years of no consequence, sub-judice reporting and a petering out of this whiole BBC/Savile connection. Which-I think you`ll find-is just wha the victims want. Who bloody asked the NSPCC for their point of view…this is the one time we do NOT need charity chuggers in the way of a license fee or attendant, continual bad news re the BBC and its pedestal pumping and trainers-titivation of Jimmy(Mr BBC) Savile. Who`s to say?…FFS….campaign to get the BBC out of Savile Stew is rolling-coming near us all again very soon, until we agree to absolve the PervyBeeb from all blame for the Savilator! The BBC are the heroes of the British anti-racist movement. If you check the link you will see that their contribution is entirely honest, remaining true to their values rather than ‘facts’. Some very good points, specially on the pro-immigration lobby group masquerading as a credible and objective university department…ie CReAM. Dustmann and Frattini published the results of their ”study” in November 2013. Less than a month later it was totally rubbished by leading statisticians, including an Emeritus Professor of Statistics from UCL itself!